That dreaded meeting with the boss—a few issues need to be discussed. Perhaps some deadlines have been missed, or a couple of angry outbursts escaped during meetings. Everyone has weaknesses that surface at work, and when they do, people address them. Therein lies the problem, say these authors. In many workplaces, the culmination of such a meeting would be an improvement plan, from which the employee would set to work on improving their weaknesses. Had their boss read this book, however, she would know that she was wasting her time, because weaknesses, as well as strengths, are hardwired into the brain, and can no more be changed than a person’s eye color. In a world in which self-help has become almost a religion, it seems sacrilegious to claim to embrace weaknesses as fundamentally unchangeable and strengths as unobtainable. But they are, according to the research presented here. The authors, a business researcher, along with a psychologist and neuropsychologist who both specialize in learning and attention disorders, have examined the research on executive skills: twelve cognitive functions that begin developing at birth and are fully developed by young adulthood. The skills include emotion control, focus, task initiation, organization, time management, flexibility, observation, and stress tolerance. Using this research, as well as their own proprietary work, the authors have developed an assessment tool called the Executive Skills Profile. They posit that every person typically is strong in two or three of these skills and weak in two or three, and efforts to improve notwithstanding, the skills are what they are. In the book’s first four chapters, readers learn about the executive skills, and use the Profile to learn how to better manage their individual skills. 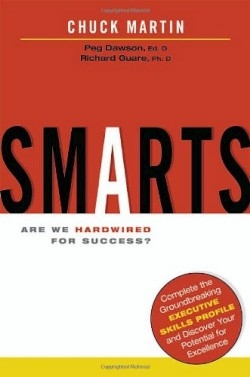 The last two chapters instruct readers in applying this knowledge to their peers, subordinates, and bosses. The ultimate goal is to align each person’s in-born strengths with the job that makes the most of them. Because weaknesses can’t be significantly altered, people only cheat themselves in the workplace if they take positions that prey on those weaknesses. Someone who has lower time-management skills, for example, will have a hard time indeed in a multi-tasking, deadline-driven office. The authors hope that “when you know that the weakness is hardwired into the people and that it is not their fault they are behaving the way they are,” everyone will become a bit more accommodating: To make this adjustment a bit easier, solutions are suggested for changing or adapting to the less-desirable behaviors.